and textured text on a textured curved path. Use Kerning and Leading to adjust the space between letters and edit the distance of the text from the path both above and below. I received an email from a gal on the net who learned how to create text on a path from an earlier tutorial. She wondered if Paint Shop Pro could create text on a textured path. As one who seeks answers, I spent a few hours poking around experimenting in PSP and discovered a few neat tricks to do just that. Let me share with you what I discovered. In Paint Shop Pro, create a new file by clicking the white paper icon on the Tool Bar at the top of the PSP window. In the New Image dialog box, type in 350 for the width, 150 for the height, pick white background from the drop down box and make sure the image type is set to 16 million colors. Press OK to open the new file. Pick the Text Tool on the Tool Palette which runs down the left hand side of the PSP window. Click in the blank image to open the Text Entry dialog box. Pick a font (Typeface) from the Name dropdown box, preferably a heavy bodied font. I picked Verdana, and pressed the bold button to make it a bit heavier. Set the size as big enough so the text fills the width of the image. Size will depend on what typeface you choose. Pick a solid fill color from the Styles box, not white, with no stroke, or textures. Any color is fine at this point. Be sure to check the radio button next to Vector in the Create as area, and check the Antialias button. Type in relevant text of your choosing. Preview the text on the image by pressing the eye button at the bottom right of the dialog box. Pressing the down arrow beside the eye provides realtime continuous previews of the changes. Use the OK button to set the text on the image. See below. On the image window a bit of basic text will look similar to mine on the left. From the bottom of the PSP Tool Palette, pick the Vector Selection Tool and click on the text in the image to select it. Then right click on the text and pick Properties from the flyout box. On the Properties dialog box that pops up, pick a Stroke style by clicking the right facing arrow next to the Stroke swatch in the styles area, pick Solid from the flyout there. Noted with red on left. Click on the color swatch for Stroke and set to R 128, G 128, and B 0 or pick the third color from the left on the second row from the top, a burnished gold. Set the Fill Style to Pattern by clicking the right facing arrow next to its swatch and picking the third choice from the left. Click directly on the Fill swatch to open the Pattern dialog box. From here first set the Scale to 100 then click the down facing arrow next to the thumbnail of the current pattern. 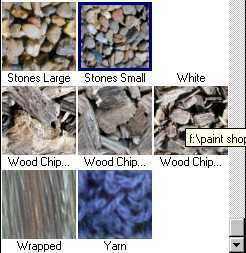 From the pattern selection palette click on the Wood Chips small icon. Back on the Vector Properties dialog box, click the right facing arrow next to the Strokes box in the Textures area and pick the texture icon from the flyout box. As with selecting a pattern above, click the texture swatch, then the down arrow next to texture thumbnail and select Grid from the palette of thumbnails. OK your way back to the Vector Properties box. Finally set the stroke width to 2 and check the Visible and Antialias boxes. The Vector Properties dialog box should look similar to mine on the left. Press OK to set the text properties on the screen. The text should look similar to mine with sort of a raggy edge. Select the Drawing Tool from Paint Shop Pro's Tool Box, third tool from the bottom. On the Tool Options Palette (toggle on by clicking the "o" key on the keyboard) set the Type to Point to Point line and the width to 2. Check the Antialias and the Create as Vector boxes, but leave the Close path box UNCHECKED. Keep the line style on plain solid line. In the image, click near the left edge under the line of text and drag just a little at the same time. This starts a curved line. Click and drag a bit in the middle, then a third time near the right side. The beginnings of a curved line. To adjust the curve, use the Vector Selection Tool and click on the line if it's not already showing the bounding box. Then right click on it. Pick Node edit from the flyout box. The bounding box disappears showing the three "nodes" along the curve. One at the beginning, one in the middle and one at the end. Click the left one which will turn black when selected. Click and drag this into a better position if necessary. Do the same to the end node on the right. Select the middle node and notice the arrow looking handle bars extending to either side of the black node. Move the node up, down or sideways to adjust the curve. Also pull either the arrow head or the tail up or down to tweak the curve. When satisfied with the curvature, right click and pick Quit Node Editing from the flyout box. The adjusted curve might look like this. Let's spiffy up our line some. Right click on the line again with the Vector Selection Tool choosing Properties from the flyout box. On the Vector Properties box, type in a new name for the default "drawing". Now let's spiffy up this boring old path. Click the right facing arrow on the Stroke Swatch in the Styles area and as we did with Text, set it to pattern. Click on the swatch itself to change the pattern. I used the same one as I did for Text, small Wood Chips. Set the Stroke width to 10. From Line style drop down box, pick the Diamond variation by scrolling down the list and clicking on its thumbnail. When the Vector Properties are all set as shown on left. The image should now resemble this example. With the Vector Selection Tool, click on either the text or the line to select it then Shift click on the other to add it to the selection. The grey thin bounding box surrounding both the line and the text parts indicates they are selected. With the Vector Selection Tool, right click inside the bounding box and pick Fit Text to Path from the flyout box. Part 4: Adjusting the distance from the text to the path. Open the Layer Palette if it is not already visible on the screen by pressing the 'L" key on the keyboard. Press the + next to Layer 1 to expand it. Notice both parts, the Textured Line and the text object. Click on the the Text Layer, in my case Khiba's PSP Page. It will remain in bold and the textured line will go dimmer. Right click on the Text object on the layer palette picking Edit Text from the flyout box. On the top right of the Text Entry dialog box, locate the Kerning and Leading boxes. Leading normally puts spaces between lines, but in this case we'll use it to move the text over or under the path. Experiment with your text and path and see what values work best for you. To put the text UNDER the path, right click again on the text object under layer 1 on the Layer Palette and pick Edit Text again. This time on the Text Entry Dialog box, set the Kerning back -25 and the Leading to 27 or so. Notice how the text flows pretty nicely under the line. Press OK to set the text. See above then result below. After tweaking the text on the path, that's about it. Save the image in the psp format by clicking the Diskette Icon on the Tool Bar at the Top of PSP. Then if you want to add any special effects, right click on Layer 1 on the Layer palette and select Convert to Raster from the flyout box. Remember, Effects can only be applied to Raster layers. Add a Drop Shadow, for example, by going to Effects > 3D Effects > Drop Shadow. I set my options on the dialog box to offsets both at 3, Opacity to 50, Blur to 9.9 and color to jet black. When finished, export to JPEG for use on the Web or whatever.